The way you exert power throughout a single pedal rotation varies in force, even more when you are seated, standing, sprinting or pacing. Manufactured in Spain from 7055 aluminum through state-of-the-art CNC-machining, the INpower 3D+ 110 BCD features sophisticated metrics to interpret your data through user-friendly software and advise you when to turn up the pace, ease off the pedals, do another interval or call it a day. Seamlessly integrated inside a compact crank axle, the INpower 3D+ 110 BCD is protected from shocks, crashes and outside contaminants, plus it allows you to maintain your bike’s sleek, elegant aesthetics. “MAS” stands for Micro Adjust Spider and means “more” in Spanish. That’s what this technology is all about: more adjustability to further optimize your Q-Rings. 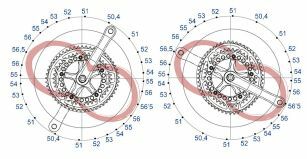 Additional bolt holes allow for intermediate positions between a Q-Ring’s existing Optimum Chainring Positions (OCP). A standard crank and Q-Ring combination offers approximately 5 degrees of OCP adjustment. MAS together with Q-Rings offer half positions of approximately 2.5 degrees of OCP adjustment. 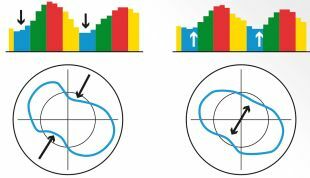 This means you can micro adjust the orientation of your Q-Rings to fine-tune your pedal performance.